Once I was a clever boy learning the arts of Oxford... is a quotation from the verses written by Bishop Richard Fleming (c.1385-1431) for his tomb in Lincoln Cathedral. Fleming, the founder of Lincoln College in Oxford, is the subject of my research for a D. Phil., and, like me, a son of the West Riding. I have remarked in the past that I have a deeply meaningful on-going relationship with a dead fifteenth century bishop... It was Fleming who, in effect, enabled me to come to Oxford and to learn its arts, and for that I am immensely grateful. Allow me to be your guide... and discover the history of Oxford with an Oxford historian. I offer a wide range of guided walks around the city and university. These can be a general introduction to the history and architecture or looking at specific themes and subjects. I am a Catholic and a historian based in Oxford, where I am a member of Oriel College. My research, for a long delayed D.Phil., is a study of Richard Fleming, Bishop of Lincoln in the second decade of the fifteenth century. I also work as a freelance tutor in History and as an independent tour guide. I was received into the Church in 2005 and am a Brother of the External Oratory of St Philip Neri at the Oxford Oratory. The Daily Telegraph website has a feature about an exhibition of Jacobite relics and memorabilia that is on show in Edinburgh. The display Bonnie Prince Charlie and the Jacobites is the biggest exhibition on the subject in 70 years and is at the national Museum of Scotland until November 12th. The coat of Prince Charles Edward. At lunchtime today I attended a Diaconal Ordination of three Dominican friars and two Franciscan Conventuals at Blackfriars here in Oxford. The Archbishop of Liverpool, himself, of course, a Dominican, was the officiating prelate. it is always good to go and support young men as the embark on their life of ministry and this occasion was well attended. Today is the 195th anniversary of the coronation of the first Emperor of Mexico, Agustín I, in 1822. There is an illustrated online life of him at Agustín de Iturbide which indicates something of the snakepit that was Mexican politics at the time of independence and thereafter. The Emperor was indeed one of the makers of a revolution that was to devour him in 1824. His model of a traditional monarchist but also national path for Mexico was to temporarily revive under the next Emperor Maximilian I in the 1860s. It was the childless Habsburg Emperor who adopted - or, in the view of some, perhaps not - Emperor Agustín's grandson as his heir, and the Iturbide family are recognised by Mexican monarchists as the Imperial claimants. There is a series of links to biographies of them - Agustín II, Maria I, Maria II, Maria III and currently Maximilian II - in the biography of the first Emperor given above. The Emperor's career and style was a distinctive mixture of traditional Hispanic models, Napoleonic motifs, and South American nationalism. One cannot but regret that it did not prosper and might well have provided greater stability and prosperity for the country. Today is the ninetieth anniversary of the first accession to the throne of H.M. 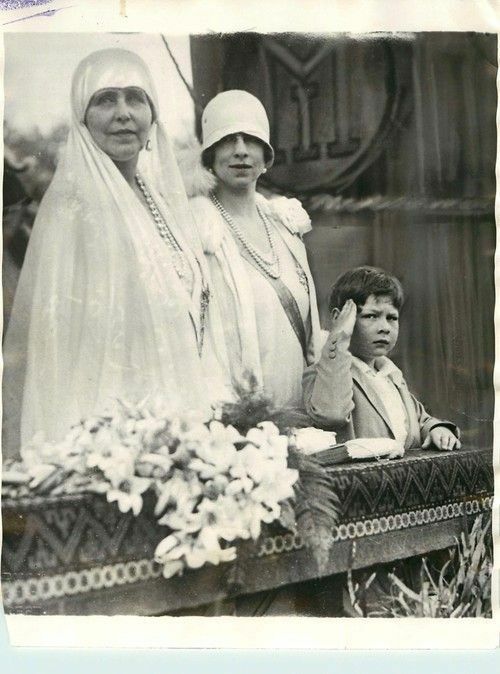 The King of Romania in 1927. This was on the occasion of the death of his grandfather King Ferdinand I, of whom there is a biography at Ferdinand I of Romania. His eldest son Carol, and father of the present King, had renounced his right of succession the previous year and went into exile with his mistress. 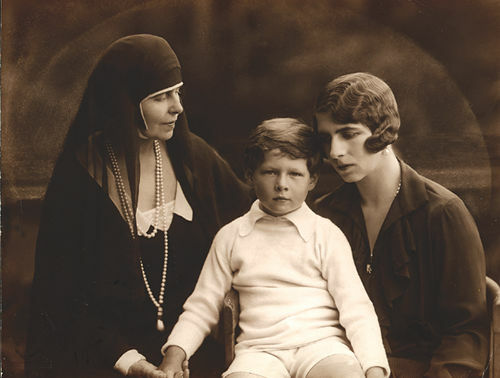 In 1930 he returned to the country, displaced the triune Regency that ruled in the name of his son and was enthroned as King Carol II. King Michael became Crown Prince until 1940 when his father abdicated and again went into exile, dying in 1953. Since 1940, most of that time, alas, in exile, the present King has been a symbol of his realm and a sign of hope to many. and his mother Princess Elena. The Order of the Elephant is the highest Danish Order one can receive and is usually handed out only to members of royal families or heads of state. The order was founded by the Danish monarch in 1457, and after a short break, it was reintroduced in 1580. Since then it has been distributed to a number of people. It was His Majesty King Christian I of Denmark and Norway who introduced the order in 1457. The King was married to Dorothea of Brandenburg, and the brotherhood was most likely inspired by the Brandenburg Swan Order, which was established in 1440. Coat of arms of Frederick IV of Denmark and Norway surrounded by the collars of the Order of the Elephant and the Order of the Dannebrog. Photo: Sodacan via Wikimedia Commons. The Order was approved by Pope Sixtus IV in 1474. During King Christian II's reign, the brotherhood ceased, but it was restored as the royal knight order under the rule of His Majesty King Frederick II. The Order consisted of only one class and has insignia designed with an elephant as the badge. The elephant has been the symbol of the Order until today. An older version of the Order exhibited at the museum. Photo: Toxophilus via Wikimedia Commons. Until 1808, the order was distributed to only royals, but after 1808, the order has been presented to non-royals. From 1892, it was also awarded to the Queen of Denmark, not just the King, and from 1958 the Order of the Elephant has been fully open to all women, regardless of whether they are royal or not. Denmark's ruling monarch is the head of the order; this is today Her Majesty Queen Margrethe II. 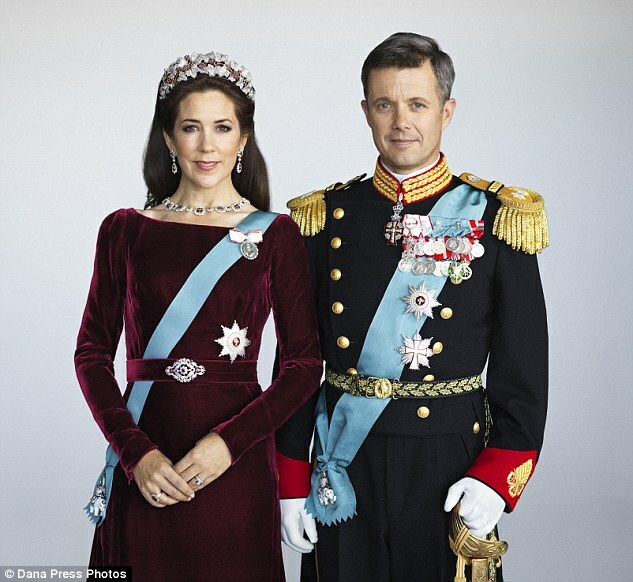 Today, the Order is administered by the “order-chapter,” which is subject to the Danish Royal Court. The Order of the Elephant still holds its headquarter in Frederiksborg Castle Church and the coat of arms of all the recipients of the order. Frederiksborg Castle, with the elephant fountain in front. Photo: Johan Jacob Bruun via Wikimedia Commons. During the Second World War, a number of influential people from the allied countries were honoured with the Order of the Elephant. In 1945, Field-Marshal Bernard Montgomery and General (later US President) Dwight D. Eisenhower were appointed as knights. In 1950, the order was awarded to Winston Churchill, although he was no longer the Prime Minister of the United Kingdom. As of today, approximately 800 people have been awarded the order, and during the rule of Her Majesty Queen Margrethe II, the Elephant Order has only been given to one ordinary Danish citizen, which occurred in 2000. The two Royal Orders of Chivalry in Denmark are The Order of the Elephant (Elefantordenen) and The Order of Dannebrog (Dannebrogordenen). The granting of either Order is solely at the pleasure of the Sovereign, unlike some other countries where they are granted on the advice of the government. Although the statutes defining this order were established in 1693 by King Christian V, its history dates back to the 15th century. It is believed to originate with a religious group who conferred a similar emblem to members of the Danish aristocracy during the reign of King Christian I (1450-1481). This consisted of a badge of the Virgin Mary holding her Son within a crescent moon, surrounded by the rays of the sun, hanging from a collar of links in the form of elephants. After the religious group died out, King Frederick II continued to award a badge of an elephant, with his profile on its side. This is believed to have been inspired by the chaplain’s badge from the religious group, which was also in the shape of an elephant. In 1693, King Christian V established the statutes for the Order as we know it today. These statutes were amended in 1959, allowing women to be created members. There is only one class – Knight of the Order of the Elephant. As with most orders of chivalry, the Danish sovereign is the head of the order. While at one time the Order was granted primarily to foreign royalty and Danish noblemen, it is now granted primarily to members of the Danish Royal Family and foreign Heads-of-State. On rare occasions, it has been granted to a commoner. The Badge of the Order is a white-enamelled gold elephant, with a cross on one side, and the reigning Sovereign’s monogram on the other. The elephant holds a tower on its back, and a Moor holding a spear on its neck. The badge is primarily worn suspended from the Sash of the order. This sash, made of light blue silk moiré, is worn over the left shoulder, with the badge resting on the right hip. The Star of the Order is an eight-point silver star, with a cross of diamonds on a red disc. This is surrounded by a silver wreath of laurel leaves. The Star is worn on the left breast whenever the sash is worn. The Collar of the Order is made of gold, in alternating links of towers and elephants. This is only worn on two occasions every year – the New Year’s Court and the Sovereign’s birthday. in 2012. Some of the dates in that post and its sources are slightly different to the ones given in the post above, indicating the rather obscure early days of the Order. As a revival of the late seventeenth century it is rather like the two revivals of the Order of the Thistle by King James VII in 1687 and by Queen Anne in 1703. 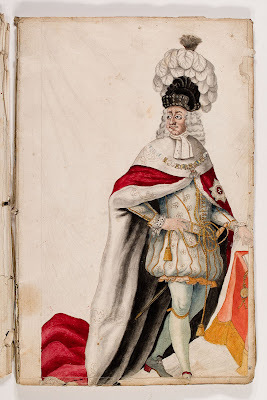 King Christian V in the robes of the Order. It was King Christian V who issued new statutes for the Order in 1693, in the earlier days of Danish absolutism. Unlike the British Orders the robes are no longer worn on ceremonial occasions but the chapel at Frederiksborg is in many ways reminiscent of the chapels at St George's Windsor, St Giles in Edinburgh and that of the Order of the Bath at Westminster Abbey, and of the Chapel of the Order of the Seraphim in Sweden. The Chapel of the Danish Royal Orders is at Frederiksborg Castle, A more than 300 years old – and still living – tradition of displaying the armorial plates of Knights of the Order of the Elephant and Knights Grand Cross of the Order of the Dannebrog in the Chapel of the Royal Orders has resulted in an impressive collection of heraldry. The current armorial plates are the work of Ronny Andersen (Royal Herald Painter). The armorial plate of Crown Princess Mary can be seen on the link to the Chapel given at the beginning of this paragraph. Why the Elephant? Elephants were no more common in fifteenth century Denmark than they are now. The probable reason why the elephant was chosen to symbolize the Order was that the battle elephant was used as a symbol of the champion of Christianity, roused by the sight of Christ's blood. In addition the elephant was the symbol of chastity and purity. Medieval typology found several symbolic links between Christ and the elephant, and it is significant that the central medallion of the star of the Order bears the cross as its device. of King Christian IX ( 1863-1906) down to the present day. indicating the extent of devotion to the memory of the Romanovs. Today is the centenary of the Proclamation by King George V in 1917 of the change of name of the British Royal family from Saxe-Coburg-Gotha to Windsor. This was, of course, a consequence of the Great War and a decision to remove dynastic links with Germany. King George V at this period of his reign. shortly before the birth of Prince Andrew. The reaction to this new name taken by his cousins of Kaiser Wilhelm II was his joke that he was looking forward to a production of "The Merry Wives of Saxe-Coburg-Gotha"
One contemporary - French I think - observed that the old Europe died when the British King changed his name because of a mere war. There is something in that.